Alas, it is true. While on vacation I received an e-mail from Full Turn Entertainment indicating that the William Shatner DVD Club was no longer able to deliver quality movies at reasonable prices. Rather than raise their rates, the club is closing its doors. I should be receiving a single shipment containing the remainder of my movies sometime in the near future. A certain squeaky wheel took me to task for not providing a more detailed report of my vacation activities in the Upper Peninsula. Hopefully this bibliocentric update should provide a little grease. The Spicy Air Tales! series are short stories that take place in FASA’s Crimson Skies universe, a pen-and-paper roleplaying game that has been adapted to a miniatures game, an excellent PC game, and one of the best Xbox games I’ve ever played (Crimson Skies: High Road to Revenge). The setting — an alternate history of the United States in which most major commerce and transportation is airborne — is brilliant, just the sort of thing that I hope to be able to create during International World Creation Month (more on that later this week). Of the reading material that I brought with me, the only thing I finished was the Stackpole short story, “Fortune’s Hunt” (which I completed in the hotel room on the way back home Saturday night). Inheritance sat on the table next to my father’s recliner for nearly two weeks, while The Once and Future King sat about fifteen feet away on the table next to my mother’s recliner. I did read two novels, though. The first I picked up on a whim from ShopKo, the second I happened across in my brother’s room while we were playing Burnout 3: Takedown on the Xbox. If John Grisham had written Jurassic Park, he couldn’t do better than Tyrannosaur Canyon. To me, that’s a tricky bit of praise; it almost seems like a back-handed compliment to mix references to Grisham and Michael Crichton. Nonetheless, it was a fun book and a quick read. The story involves a lost moon rock specimen, a murdered prospector, a greedy scientist, a hired gun, and a millionaire veterinarian; an interesting mix of characters, some clever science and a few twists. It’s a bit predictable at times, but still managed to pull the rug out from under my feet once or twice. Storm Front (Book One of The Dresden Files) by Jim ButcherTwo of my co-hosts on The Round Table have read this book and SciFi is premiering a new show based on the series later this month. That was enough to pique my interest, so it was a happy coincidence that my brother had a copy of the first book in the series. For those who don’t know, The Dresden Files is about a private detective who also happens to be a wizard. It’s Harry Potter meets Sam Spade, and Storm Front turned out to be a pretty good story. I also bought three more books while on vacation, all from a used bookstore called Back Room Books. I worked at “the Back Room” for a few months before moving to Ohio in 1994. The owner has since moved and greatly expanded the store. This one will likely sit on my bookshelf until I read books two through five in the series, but I couldn’t pass up the bargain. I’ve read a couple of Preston and Child’s collaborations in the past (most notably Relic), so this seemed like a fairly safe bet. Turns out it’s the second book in a trilogy, which probably means I’ll have to pick up the first, Brimstone, in the near future. This one appears to be the predecessor to Tyrannosaur Canyon. Unless I miss my guess, the story will fill in the back story of Tom Broadbent, the millionaire veterinarian. So, I’ve got a lot of reading ahead of me. I’m not about to undertake one of those “50 Book” challenges I’ve read about, but I would like to do a lot more reading in 2007 than I did in 2006. Maybe I’ll even finish a few of the books I brought with me on vacation (I’m about a quarter of the way through The Once and Future King and halfway through Down and Out in the Magic Kingdom). When I do finish a book (especially those I bought at used bookstores), there’s a good chance I’ll pass it on to a friend or even release it into the wild and use Book Crossing to track it. Book Crossing allows readers to register books, label them, and then track them as they travel across the country or even the world. If you see a book lying on a bench in your local mall or seemingly forgotten in a coffee shop, check inside the front cover to see if there’s a Book Crossing label; it might just have been left there on purpose. Finally, I wanted to mention Book Darts, a unique, clever, unobtrusive bookmark that allows you to mark your spot in a book without sticking out or damaging pages. When I picked up a copy of 1984 from Half Price Books last year, there was a Book Dart already in it and I didn’t even notice until after I’d started reading. I had no idea what the thin, arrow-shaped piece of folded metal (brass or bronze, from the look of it) was until I stumbled across the Book Darts website today. You can pick up a tin containing 75 darts for about ten bucks, and I’m thinking they’d make a nice addition to books I release into the wild or give to friends. After nearly two weeks in the U.P., we’re back home. More about the vacation later, but for now I wanted to share two images of carnage (click to enlarge). 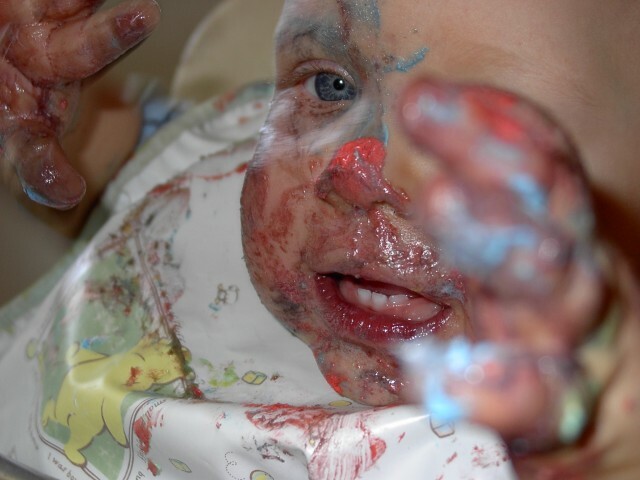 First, a picture of Kyle after his encounter with a “smash cake” during the post-Christmas family birthday partySeveral members of the Johnson Clan have birthdays shortly after Christmas, so we got together to celebrate them all last week.. The cake (images of which I’ll upload later) was assembled by my mother and partially disassembled by Kyle. 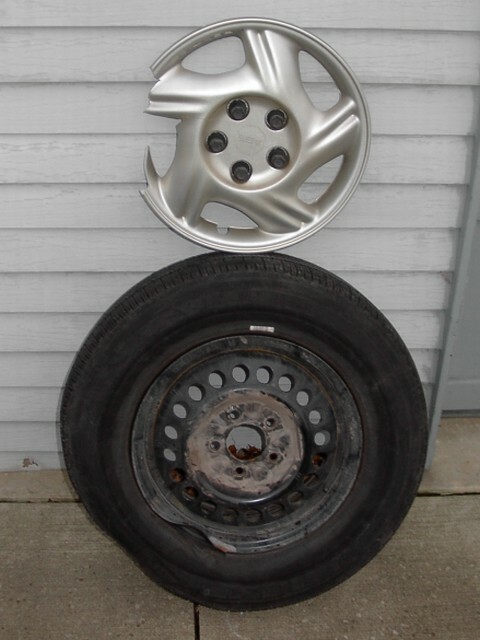 Second, a picture of the passenger-side rear wheel of the MVoD following an encounter with an unidentified road object on the Ohio Turnpike yesterday between Toledo and Cleveland. I had to change the tire on the side of the turnpike, and I’m in the process of acquiring a new wheel right now but the important thing is that no one was hurt and we made it home without further incident (albeit at significantly reduced speed for the remainder of the journey).